Be a Space Ranger every day at school with this brilliant new backpack. 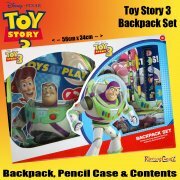 Suitable for ages 3+, this full size, brightly coloured backpack is strong, well made and perfect for any young Toy Story fan. It measures approx 40cm in height and 30cm wide at the base. 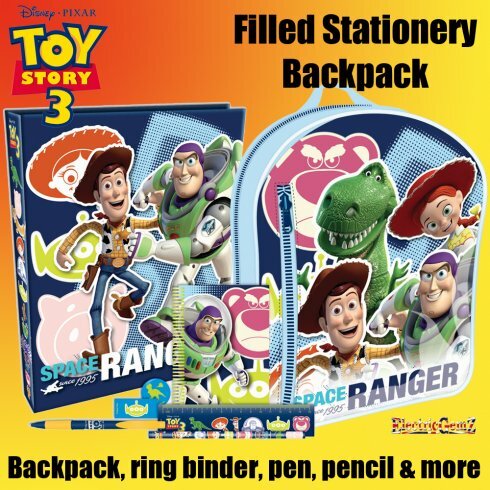 Inside is an equally brightly coloured A4 ring binder, plus a selection of stationery items: pen, pencil, sharpener, eraser, ruler and scribble pad. A great back to school or festive gift.